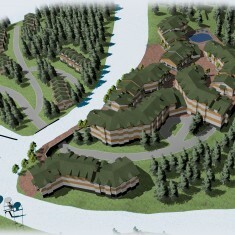 Bukovel | Bukovel | Ecosign Mountain Resort Planners Ltd.
Bukovel Mountain Resort is located in the Carpathian Mountains, 100 kilometers southwest of the City of Ivano-Frankivsk, Ukraine. 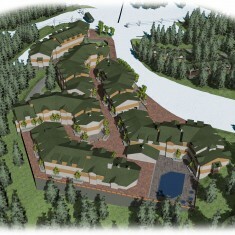 Ecosign commenced working with the new resort developer, Skorzonera Ltd., during the summer of 2004 in preparation of a new Ski Area Master Plan. Ecosign’s Ski Area Master Plan called for the installation of 26 major lifts with a combined hourly capacity of 57,000 skiers per hour to comfortably accommodate 19,500 skiers per day on 379 hectares of pistes. At build out in Phase V the area will have 118 kilometers of ski slopes making it one of the 50 largest ski resorts in the world. The area has been developed aggressively and already has 16 lifts, 12 of which have been installed since 2006. Fifty kilometers of pistes have been constructed. 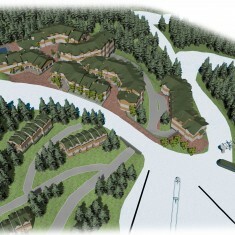 Bukovel has constructed and currently operates over 2,200 beds and an additional 1,000 beds (owned by others) are located within walking distance to the lifts. Surrounding villages and area can accommodate up to 15,000 guests in various forms of overnight accommodation. 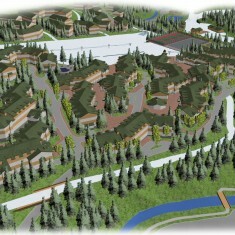 Bukovel has also constructed over 5,000 guest parking stalls to support the ski resort’s overall capacity of 19,500 skiers per day. A total of 3,300 parking stalls are contained within two parking structures near the village center and within walking distance to the ski lifts and an additional 1,700 surface parking stalls are situated in various locations throughout the resort. 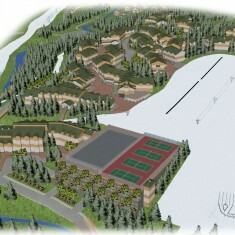 List of other activities/ amenities at the resort: Ice-skating-rink, giant slalom and mogul courses, snowmobile tours, heli-tours, summer hiking, lift accessed sightseeing and dining, airbag training center, cycle racing, Segway, basketball, volleyball, badminton, paintball, ping-pong, beach and lake area, Medical-center, SPA-center (different kinds of cosmetic and spa-manipulations), entertainment center BUKA (disco and nightclub, pub, billiards, bowling, hookah, conference hall). Bukovel Resort is considered one of the fastest growing mountain resorts in the world and is Ukraine’s first European class mountain resort. The area recorded a staggering 1.2 million skier visits during the 2010/2011 ski season up from 50,000 skier visits in 2004.